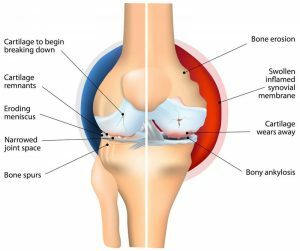 Knee is the largest, more weight bearing joint in your body. It is a complex joint made of bone, cartilage, synovial fluid and ligaments. The cartilage with healthy Synovial fluid in the knee acts as a cushion and gliding surface. Injuries, aging and degenerative conditions such as arthritis can change the quality of synovial fluid that distort the cartilage surface and cause pain. 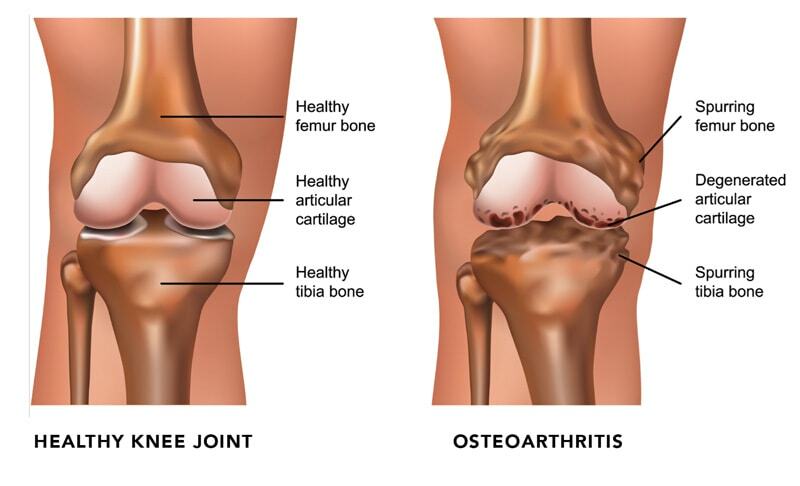 Osteoarthritis (OA) is one of the major causes of knee pain and the usual sufferers are those over 40 and former athletes who had knee injuries in their youth. This disease is the gradual and painful deterioration of the articular cartilage and subchondral bone in the joint due to deterioration in the quality of Synovial fluid that lubricates the joints. As this cartilage thins, the bones rub against each other, and the lining of the joints which is full of nerves becomes sensitive to pain. During the initial stages, pain and stiffness in the morning or after strenuous activity is experienced but this is usually relieved in less than an hour. Rheumatoid arthritis can affect joints on both sides of the body (both knees, both hands and/or both wrists). In rheumatoid arthritis, your body’s cells attack your own tissues. Rheumatoid arthritis affects three to five times more women than men and often presents between the ages of 20 and 50. Over time, rheumatoid arthritis can cause cartilage to wear away, swelling in the synovium, and excess fluid in the knee. In later stages, bones can rub against each other. Bursitis is the inflammation of any of the fluid-filled sacs (bursae) protecting the body’s joints. This is usually caused by repetitive motions or by a stress such as kneeling. Sometimes, a sudden injury can cause bursitis. The tendons – rope-like tissues connecting muscles to bone at the knee and other joints – can become painfully inflamed by repetitive and strenuous movement. Tendonitis is a common sports injury, caused by overuse of the same parts of the body. 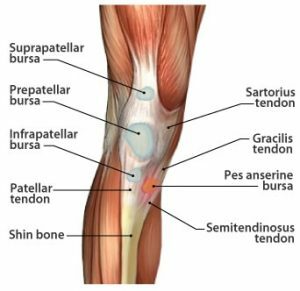 Patellar tendinitis, or “jumper’s knee,” is an inflammation or irritation of the tendon between the knee cap and the shin bone. Knee pain or discomfort while walking up and down stairs, jumping or squatting may be symptoms of patellofemoral pain syndrome. This common knee problem is felt toward the front of the knee. It can cause a grinding sensation when bending or straightening your leg, and can cause the knee to occasionally buckle. Sometimes called “runner’s knee,” patellofemoral pain syndrome may be caused by a kneecap that is not aligned properly, overuse, injury, excess weight or when the cartilage in the knee cap is worn significantly. Knee injuries can be the result of sports, falls or trauma. They typically involve the ligaments that hold two of the bones of the knee – the femur and tibia – together eg-ACL, MCL,& Meniscal injuries. Investigations like X-rays, MRI, CT Scan.